A healthy spiny buttercup (Ranunculus muricatus). 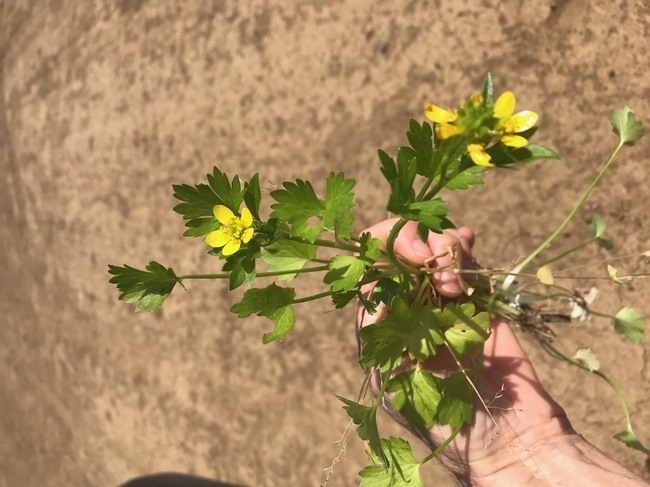 First, according to Dr. Birgit Puschner, UC Davis Vet Med Toxicologist, all buttercups contain ranunculin, though there are differences in species in terms of toxin levels. In pastures, because the plant is bitter, animals simply eat around it. But if ingesting the fresh plant, they can develop blisters. The toxin degrades in hay; thus, it's only a problem in grazing and fresh exposures. Second, according to Dr. Gilbertson, UC Davis Plant Pathologist and Ozgur Batuman, former UCD Post Doc, buttercup is a significant host of tomato spotted wilt virus (TSWV). Other important weed hosts for TSWV include cheeseweed (Malva parviflora), sowthistle (Sonchus oleraceus), and prickly lettuce (Lactuca serriola). TSWV crop hosts include peppers, tomato, lettuce, and bell beans (fava). The primary vector of TSWV is the western flower thrips, a tiny insect that feeds on the plant foliage. Immature thrips pick up this pathogen from infected plants and transmit it to healthy ones when they become adults and disperse to new host plants. TSWV is not transmitted via seed. Symptoms of TSWV typically include necrotic spots, often with tip or leaf dieback that looks like drift from a contact broadleaf herbicide. However, there is a lot of variability in the symptoms of TSWV depending on the host that could be confused with other problems. As such, if you suspect TSWV in your crop, the best way to positively identify it is by using on-site tools to test for this disease, such as ImmunoStrip® tests. A good resource for TSWV in tomatoes is: Tomato spotted wilt disease in tomatoes. 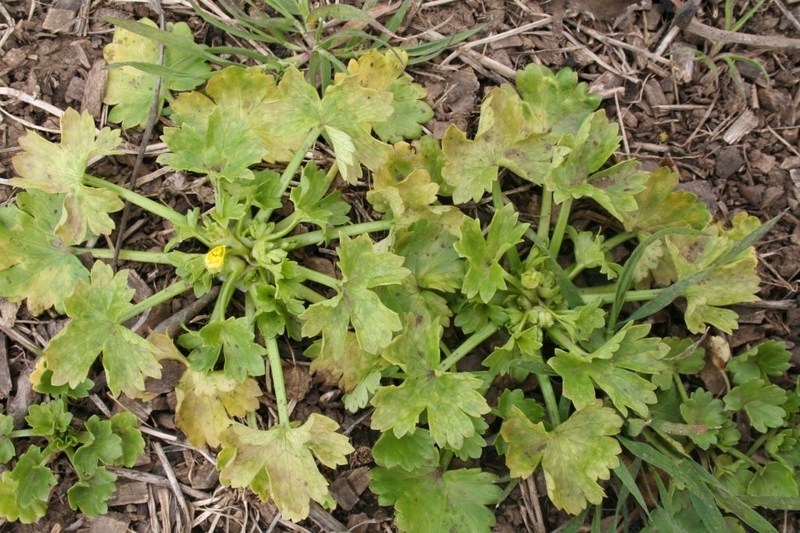 Watch for spiny buttercup and control this weed to keep it from spreading. We need to keep our pastures safe and TSWV out of our crops.